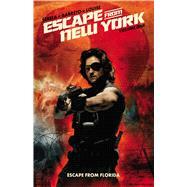 John Carpenter's classic antihero, Snake Plissken, is back! After bringing the John Carpenter classic Big trouble in Little China to comics, the response has been so strong that we knew we had to bring another Carpenter classic to comics in a style and approach that does Escape From New York justice. Eisner-nominated writer Christopher Sebela (HIGH CRIMES, DEAD LETTERS) and artist Diego Barreto (IRREDEEMABLE) bring a action-packed adventure that rocks for both long-time Snake fans and newcomers.